Palestinian commentator and human rights advocate, co-founder of the Palestinian civil society Boycott, Divestment and Sanctions (BDS) movement, and author of Boycott, Divestment, Sanctions: The Global Struggle for Palestinian Rights (2011). Q - On March 9, in a major BDS-related development, private prison company G4S announced that it will end its dealings with the Israeli army within 12-24 months, reportedly due to concerns that its complicity in Israeli human rights violations was harming the company’s bottom line and international image. The decision followed a four-year campaign by human rights activists such as yourself. Can you explain the significance of this decision and what it means in practical terms? “If our ongoing BDS campaign compels G4S to follow through with its announcement by ending all these forms of complicity in Israel’s violations of international law, this will confirm a domino effect. G4S would then become the fourth multinational to abandon the Israeli market, in the last few months alone, due to heavy losses and/or reputational risk following effective and strategic BDS campaigns. “In September 2015, French corporate giant Veolia set the trend by selling off all of its businesses in Israel after losing tenders and contracts worth billions of dollars following a seven-year BDS campaign against its role in illegal Israeli settlement projects. “Irish building materials corporation CRH has more recently exited the Israeli market, selling off its 25% stake in the Israeli occupation-profiteer Nesher Cement. “French telecommunications giant Orange announced earlier this year the termination of its franchise relationship with Israeli Partner Communications, after intense BDS pressure in France and Egypt. “In a related major development, the $20-billion pension fund of the United Methodist Church declared in January 2016 the five largest Israeli banks off limits for investment and divested from the two that it held in its portfolios. “The Israel Export Institute has revealed that Israel’s exports in 2015 have dropped by 7% over 2014, partially due to BDS. “Foreign direct investment in Israel dropped by 46% in 2014 as compared to 2013, according to a UN report. One of the report’s authors admitted that BDS played a key role in this sharp drop. Q - What do you make of G4S's comment that the pullout from Israel is "for entirely commercial reasons" and unrelated to the BDS campaign? OB - “Of course it is. That’s the very logic of the BDS campaigns for corporate accountability. “As was the case at the height of the international boycott of apartheid South Africa, BDS pressure is making some of the world’s largest corporations realize that profiting from Israel’s regime of occupation, settler-colonialism and apartheid is becoming commercially untenable. “It is no coincidence that G4S’s announcement specified three areas that it was withdrawing from, all connected to the reputational damage that it has suffered in recent years. Q - Why was G4S selected for a BDS campaign and what other companies are you focusing on right now? OB - “The Palestinian BDS National Committee (BNC), the broadest coalition in Palestinian civil society which leads the global BDS movement, employs several criteria in selecting strategic BDS targets. “These include the level of complicity of the company. We focus on companies and products that are most clearly involved in Israel’s human rights violations and easiest to explain to a wide mainstream audience. G4S’s involvement in Israeli prisons, where Palestinian prisoners are regularly tortured and ill-treated, and in securing illegal settlements, makes it a top priority. “We also consider the potential for success. 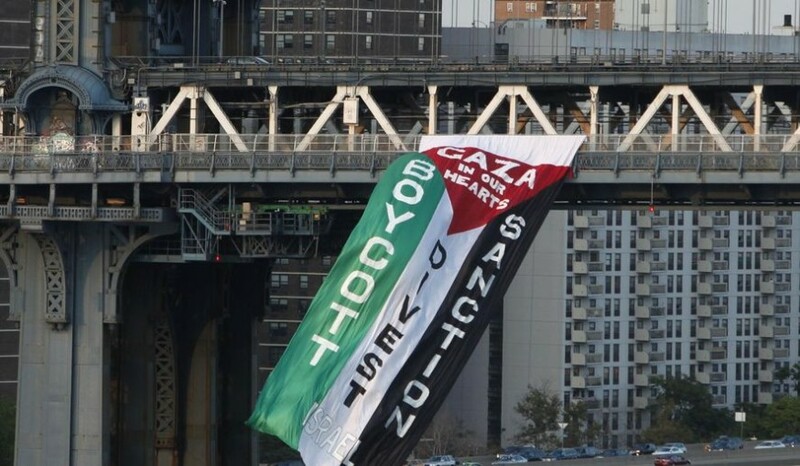 A BDS campaign should have a realistic chance of success, beyond simply raising awareness. As human rights activists, we invest our time most effectively to achieve tangible results. As G4S’s announcement reveals, our chances of success against it, as was the case against Veolia, CRH and Orange, are quite significant. “The BDS movement’s top priorities include imposing a military embargo on Israel similar to that imposed on apartheid South Africa. The leading Israeli weapons manufacturer Elbit is therefore high on the list of BDS targets. So are Israeli banks, which are involved in financing the occupation and settlements. “There is a growing BDS campaign against HP, due to its contracts with the Israeli military and settlements as well as its involvement in denying Palestinians freedom of movement. Q - In addition to the recent decision by G4S, there have been a number of significant developments related to BDS in recent months, including the controversy over the Israeli government's attempts to whitewash its image by subsidizing free trips to Israel offered to this year's top Oscar nominees, and the recent unprecedented decision of the United Methodist pension fund to divest from Israeli banks due to their ties to settlements built illegally on occupied Palestinian land. How would you characterize this moment for BDS, particularly in the US? OB - “This is a watershed moment for BDS, particularly in the United States. Over the past year or so, we have witnessed a significant growth in support for the movement in mainline churches, student governments, academic associations, labor unions, and racial justice advocacy groups. An impressively growing number of young Jewish-Americans is joining BDS as well. “A recent US public opinion poll, for instance, shows that almost half of the Democratic Party’s ‘opinion elites’ characterize Israel as a ‘racist’ state, and this past December a poll was released showing that 49% of Democrats would support economic sanctions or more serious action against Israel due to settlement construction. “In less than 12 months, the Presbyterian Church (USA) and United Church of Christ voted to divest from companies that profit from Israel’s abuses of Palestinian rights. This past January the United Methodist Church took the unprecedented step of divesting from Israeli banks due to their ties to settlements. “The message that a sizeable coalition of BDS partners in the US and UK sent to Oscar nominees, urging them to reject Israel’s propaganda trips, has reached a much wider mainstream audience than initially anticipated. “Just as Jonathan Demme and Martin Scorsese founded Filmmakers United Against Apartheid to protest the racist regime in South Africa in the 1980s, Palestinian artists and human rights activists urged Hollywood figures to act with conscience by refusing to lend their names to Israel’s desperate attempts to whitewash its crimes against the Palestinians. 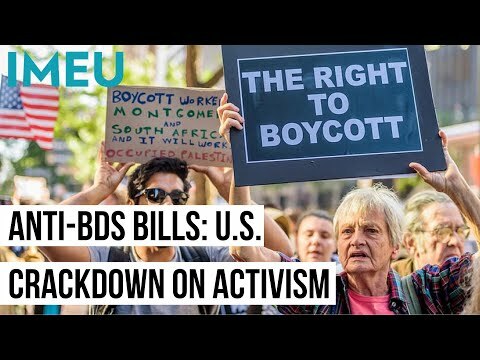 “In another desperate attempt to suppress BDS from above, after losing many battles for the hearts and minds at the grassroots level, Israel and its lobby groups are pressuring governments, legislatures and officials in the United States and other western countries to pass anti-BDS legislation and implement patently anti-democratic measures that threaten civil liberties at large. “So far, anti-BDS bills have been introduced and/or passed in nearly two-dozen states. They seek to create ‘blacklists’ of companies, organizations, and in some cases individuals as well, that heed the human rights appeals of BDS, and to bar the state from investing in or doing business with them. “These Israeli-induced attacks on free speech and civil rights are fostering a menacing environment of bullying, intimidation and repression that has all the hallmarks of the era of McCarthyism in the US and the worst days of the apartheid regime in South Africa. Q - What do you hope to ultimately achieve with BDS? OB - “BDS is a global movement launched in 2005 by the absolute majority in Palestinian civil society to contribute to the struggle for Palestinian freedom, justice and equality. It is led by the Palestinian BDS National Committee (BNC), the broadest Palestinian coalition. “Anchored in the Universal Declaration of Human Rights, BDS is an inclusive, nonviolent movement that is categorically opposed to all forms of racism and discrimination, including anti-Semitism and Islamophobia. “BDS calls for an end to Israel’s occupation of Palestinian and other Arab territories occupied since 1967, including dismantling its West Bank wall and colonies. It also calls for an end to Israel’s system of racial discrimination against its Palestinian citizens, which meets the UN definition of apartheid, and the realization of the UN-sanctioned and inherent right of Palestinian refugees to return to their homes of origin, from which they were expelled during Israel’s establishment and subsequently. “These three basic rights correspond to the three main components of the Palestinian people: those in the Gaza Strip and the West Bank, including East Jerusalem, who make about 38% of the Palestinian people, according to 2014 statistics; Palestinian citizens of Israel, who comprise about 12% of Palestinians; and those in exile, about 50% of the Palestinian population. More than two thirds of Palestinians are refugees or internally displaced persons. “Without effective, morally consistent internal resistance and outside solidarity, Palestinians alone cannot end Israel’s multi-tiered system of injustice. BDS targets this system in all fields -- academic, cultural, economic and military. “BDS and Israel’s shift to the far-right, with its ‘most racist government’ ever, have exposed Israel’s true face as a regime of occupation and apartheid and widely increased support for Palestinian rights among people of conscience around the world. We are approaching our South Africa moment.